Do your Jewelry display stands need to be updated? We are pleased to offer a wide array of accessories for holding and selling everything from wire bangles to stud earrings and diamond rings. These wholesale jewelry display stands, while priced at industry low prices, have high volume bulk pricing starting at just four items (bulk pricing varies from product to product). Our offerings are available for sale in acrylic plastic or powder-coated metal. The jewelry display stands, also known as earring and bracelet trees, are unique enough to stand on their own but are also grouped to be used as matching units. What styles of jewelry display racks are available? Our catalog of wholesale earring and necklace holders covers the entire spectrum of fashion accessories that have a custom feel. Whether your company sells rings and bracelets only or you are just an avid earring collector we have display stands to meet any need. Are you the sole proprietor of your own business whom sells at farmers markets and craft fairs or are you a sales representative who showcases at large expos for major companies? 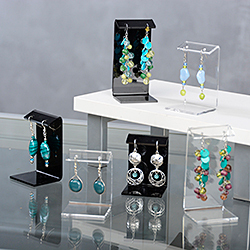 Our selection of quick ship acrylic earring and bracelet holders with same day shipping can be ordered with confidence and be at your business before the big event. Our display racks for retail use feature our largest and most broad grouping of what we call multi-functional display stands. These custom items are not delineated by shape, size, color or material. The common thread with these pieces is the simple fact that they are utilitarian in nature in that they are designed to hold everything: bracelets, earrings, necklaces, scarfs, sunglasses, headbands, and even purses and handbags. In this category you will find our complete Versattach Series of store fixtures which feature a textured gun metal gray finish which would fit in any high end boutique. Aside from the Versattach tree and tower line we also offer many single and double tier spinning and stationary racks with hooks, pegs and rods for holding all manners of accessories and supplies. 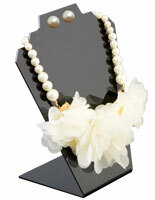 Necklace busts and trees manufactured from acrylic plastic are the most affordable. Featuring models in both clear and black, the busts are available in leaf and shoulder styles. 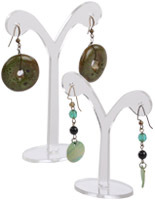 The smaller trees are designed for earring display with two to three sizes included in one low price. 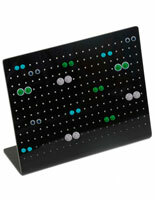 Our custom selection of stands and ring holders is continually expanding and growing to fit the needs of our cliental. 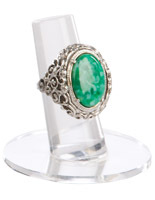 We have strived to put together the best listing of fashion accessories we could find that meet our high standards. These wholesale store fixtures have been presented at low prices with bulk order discounts so that you may supply your entire store with top of the line merchandise without blowing your entire budget. As a business ourselves we know that your business is your life and while we have designed our product line to be easy to use and free of known flaws we know that questions come up which is why we have an entire division of our company dedicated to serving you. Our call center staff is trained on all of our product lines and we hold regular weekly meetings on our product lines so that we are better prepared to field your questions. Feel confident in shopping with the supply leader: StoreFixture.com.